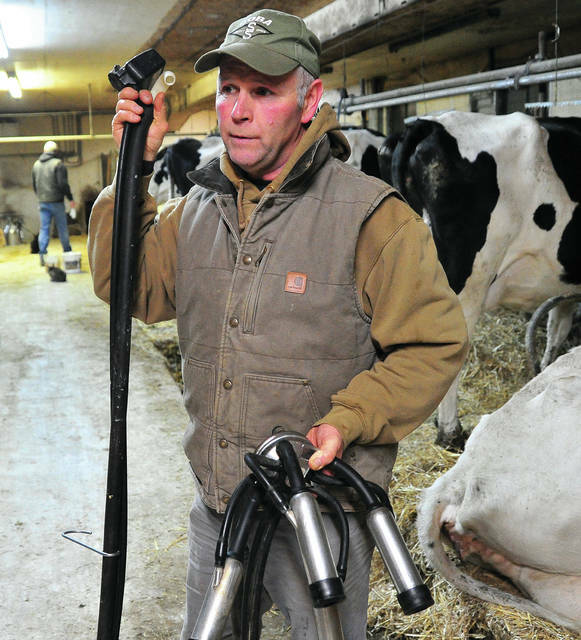 Jeff Knoop gets ready to attach a milking machine to one of his dairy cows. 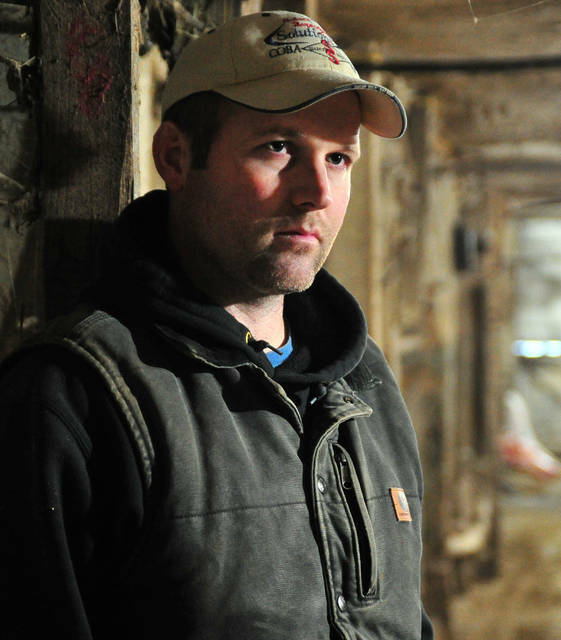 Josh Knoop carries milking equipment down the aisle at the family dairy farm in Brown Township recently. Josh teaches at Tecumseh High School in addition to being the fourth-generation of Knoop family to work in the dairy business. 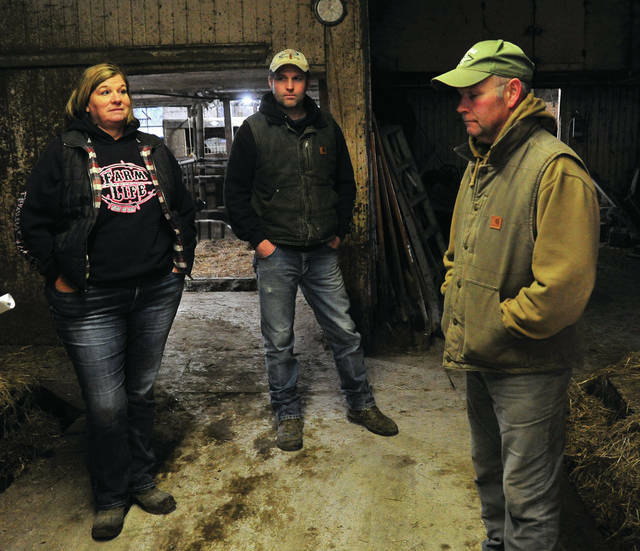 Kathy, Josh, and Jeff Knoop, discuss the decline in the dairy business that prompted their difficult decision to get out of the dairy business. MIAMI COUNTY — While the $1 gallon of milk may be a boon for the consumer, it’s been a bust for the American dairy industry’s small to mid-sized farmers. Small to mid-size dairies across Ohio and the country are shutting their doors in record numbers after nearly four years of low milk prices and rising operating expenses. In October 2018, there were 2,130 dairy farms in Ohio. To date, 2,045 dairy farms remain— a total of 85 dairy farms called it quits in Ohio in three months. “That’s enormous. It’s not just small farms, it’s medium size farms and large farms … a lot of these are closed for good,” she said. For one local Miami County family, four straight years of low milk prices means walking away from their prized registered herd, leaving behind an agricultural lifestyle that has been in their family for generations. Jeff and Kathy Knoop of Fletcher shared how they, too, will join the national dairy farm “exodus.” The Knoop family has operated a dairy farm for generations, starting with Jeff’s grandfather John, then his father Hugh. With low milk prices and no indication of improvement for the commodity, the Knoop dairy, which has 64 milking stalls all full at one time, started the process to down size last fall and eventually will bow out in 2019. According to the USDA census and statistics, Miami County had 25 dairies in 1997; 27 in 2002; 21 in 2007; and 15 in 2012. According to Amanda Bennett, OSU Miami County extension field specialist, nine dairies remain in Miami County to date. Jeff Knoop shared their farm’s break-even milk price is $16-17 per hundred pounds, today’s price is about $14.44 per hundred pounds. When prices dropped to $12 per hundred pounds last February, Kathy thought there had been a mistake in their bi-weekly milk check. It was shortly after the family sat down to plan for their exit out of the business for good. 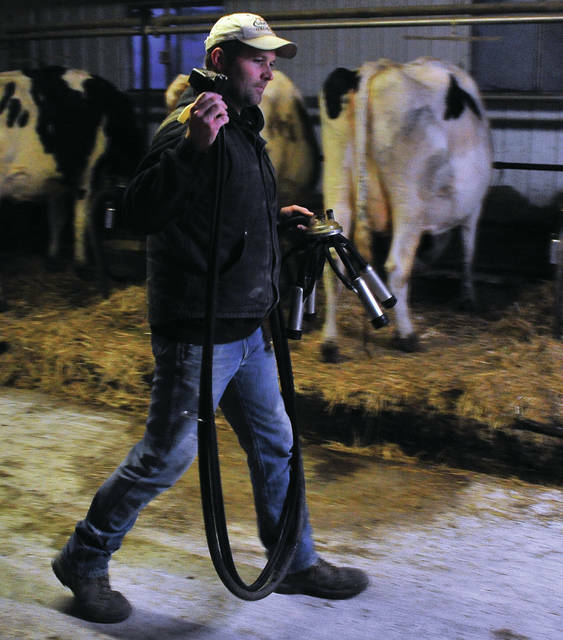 Jeff said he felt the downturn in 2009 when grain prices spiked, devastating the dairy industry, noting the last time the dairy industry was “good” was in the mid-’90s up through 2005, before its slow descent. “Everything in the dairy industry has always went in cycles. You had several years of really good milk prices and then it’d go down and it’s just been down the last eight years,” Jeff said. Jeff said no silage was planted or harvested to feed their dairy herd to prepare for 2019. The Knoops sold half of their milking cows to a Mennonite farmer in Chillicothe last October. 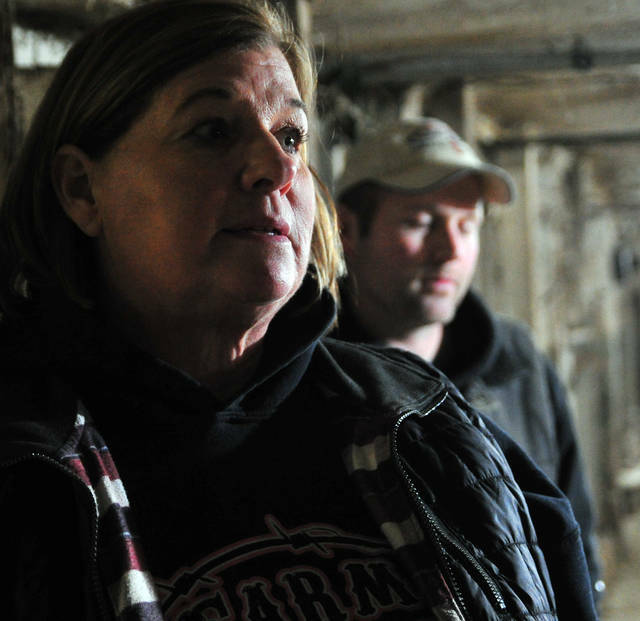 Kathy shared how watching half their cow herd leave the farm was an emotional day. Jeff, visibly upset, just shakes his head as he continues setting up to milk the rest of the herd. Knoop said the remaining cows will be fed out until the silage is depleted. The rest of the cows will likely be sold at a livestock yard in DeGraff unless another buyer steps in. Like the majority of small to mid-sized dairy farmers, it’s a family operation passed down from generation-to-generation. The Knoops milking operation is located on his father Hugh’s farm in Brown Township. Milked out twice a day every day, their son Josh, a history and government teacher at Tecumseh Local Schools, gets up at 4 a.m. and gets the milking process started on his grandfather’s farm. Jeff joins him to finish milking before Josh leaves to teach for the day. Kathy, the transportation director at Miami East Local Schools, helps after she finishes her bus routes in the morning and evenings. When the milk price plummeted, the Knoops had to lay off family members including Jeff’s brother Alan’s wife Rhonda who would feed and milk as well as nephews who helped with the milking and chores on the farm. Kathy shared that the most difficult part for her was the decision to lay off family. It’s the” ripple effect” in the local dairy closing that the community, and later consumers, may see, according to Shoemaker. Josh said the exit out of the diary business will be tough due to work being a family affair, which his own son was starting to join. Josh’s son young son Luke walked in the barn after half the herd was sold and was looking for his cow “Honest” in the stalls. “That was hard tell him that ‘his cow’ Honest had to go to another farm,” Kathy said, noting they paired their grandson up with another to take the cow’s place. Jeff can point out the lineage of each cow in the stall, even ones bred from his 4-H project in his youth. Josh can do the same. While the Knoops are still toying with keeping some part of the livestock at their farm, Jeff was quick to state no one with their last name will start up another dairy in his lifetime due to the start-up costs and the years of breeding it takes to optimize production. Josh shared how he had once expressed interest in going into the diary farming business before he attended college, but his parents talked him out of it, thus leading him to chose a career in teaching. The plight of the dairy industry made national news in 2018 when dairy co-ops starting inserting suicide prevention information along with their milk checks. Kathy shared her stunned reaction when she found one enclosed in their milk checks last spring. “It was like a slap in the face,” she said. Jeff said many dairy product corporations are switching to “one-stop and drop” operations where milk comes from one large operation instead of several smaller farms filling a milk truck together. 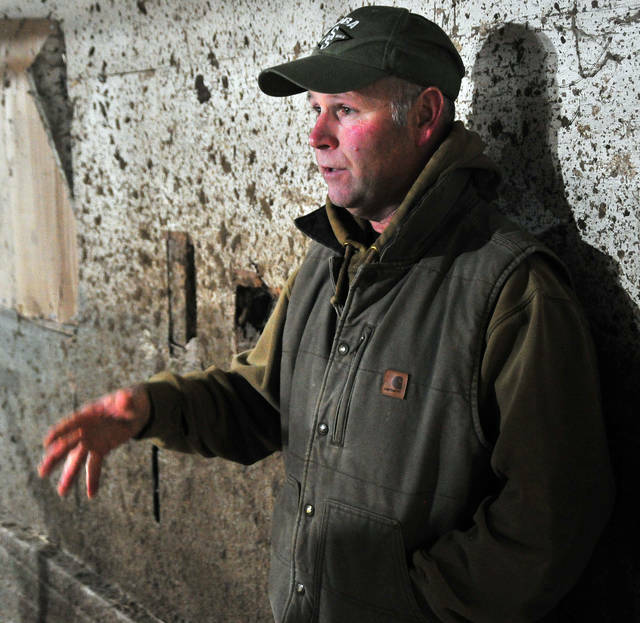 Jeff also attributes the surplus and its impact on his farm to social media, which he feels has attacked his livelihood with misinformation from groups such as PETA as well as the surge in soy and almond “juice” and alternative dairy products. Both Jeff and Kathy point out the American diet void of starting the day with a cold glass of milk, instead opting for soda or energy drinks. “This is the only agriculture industry, the only one, that is inspected on the farm. You have to pass a state inspection. No hog producer has to pass an on-farm inspection. His is done after it’s killed. Sheep, chicken, eggs, beef, the same way. You can’t even grow lettuce today and not have it recalled. There’s never been a recall on milk. Ever. Never. It’s the safest food you can absolutely have,” Jeff said. “Nothing that can leave this farm with antibiotics in it. It’s tested,” Jeff said, sharing how he’d fight misinformation being spread about their product on social media. Kathy also noted most of the milk in the dairy aisles aren’t from local sources. She said she entered codes located on the containers and found milk in large grocery chains came from the East Coast. She found gallons of milk sold under the Friendly Farms label at Aldi come from Springfield. While the exit out of the agriculture sector they love is still in the process, the Knoops found a silver lining in the fact their farm isn’t in debt like many they know in the business. While each cow is known by name and its breeding lineage and not by ear tag number, the Knoops consider themselves lucky knowing they aren’t passing down farm loans or in danger of losing everything to creditors. Kathy shared how they are making plans for retirement in the coming years and ways they’ll be enjoying their family outside of the farm. She also shared how her husband Jeff is looking forward to hiking trips with their son Kyle, a Troy Police officer, and they both will still tend to other farm projects outside of the dairy parlor. “We’re going to be OK. It’s going to take some time getting used to it, but we’ll be OK,” she said.